Secrease's Martial Arts Academy South Bay (SMAASB), established in 2012 in Los Altos, CA, is a satellite school of Secrease's Martial Arts Academy (SMAA) in Oakland, which was started by the late Grand Master Luther Secrease on September 13, 1981 and is currently under the leadership of Master Sudan Muhammad. Mr. Taylor and Mr. Chang continues the teaching and philosophy of Grand Master Luther Secrease and passing on the legacy he left. Our program offers training in TaeKwonDo for children, teens, and adults. They system we teach is TaeKwonDo (Moo Dok Kwon). Tae mean feet, Kwon means hand, Do means a way to study. All together it means to study of hands and feet. Students will improve their mental and physical capacity while building confidence, discipline, and focus. Students are also encouraged to mentor other students. Our goal is to go beyond just teaching students how to punch and kick. We focus on the mental and spiritual development of the whole student to cultivate characteristics that translate to success in all areas of their lives. Secrease's Martial Arts Academy South Bay (SMAASB) continues on the tradition, teachings and philosophy of the late Grand Master Luther Secrease. We are honored to have been taught by him and honored that we are continuing his legacy. Below is biography of our masters, our mentor, our life coach and our friend. Luther Otto Secrease, Jr. was born on January 15, 1950 in Bastrop, Louisiana. He departed his life on September 29, 2008. He grew up in the Bay Area where he attended Roosevelt Junior High School and Oakland High School. After graduating from Oakland High School in 1968 he went on to attend and graduate from California State University, San Francisco. Soon after receiving his college degree in 1971, he went on to obtain his Masters in Education from Jackson State University. Luther began his involvement in TaeKwonDo in 1969 and few years later he begain teaching throughout the entire Peralta College systems. He became very successful, highly motivated, nationally ranked fighter up until his retirement from active competition in 1980. Soon after, he devoted his time and energy to teaching. 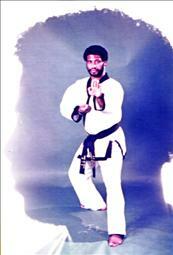 He was a 1st degree Black Belt in Wado-Kai (a Japanese style) and 7th degree Black Belt in TaeKwonDo.